Keep up with all the latest AIFA news and activity by subscribing to our newsletter or following us on Facebook and Twitter. Sjögrens syndrome is an autoimmune disease in which the immune system attacks the lacrimal and salivary glands decreasing the production of tears, saliva and moisture production in the body. This causes the most common symptoms of Sjögrens syndrome, namely dryness of the eyes and mouth. Sjögren's is one of the most prevalent autoimmune disorders, striking as many as 1 in 200 Australians. 9 out of 10 patients are women. Symptoms can plateau, worsen, or go into remission. While some people experience mild symptoms, others suffer debilitating symptoms that greatly impair their quality of life. 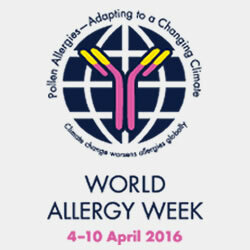 Climate changes are lengthening the pollen allergy seasons resulting in increased intensity of allergen exposure world-wide. Pollen allergy (hay fever) and other allergies, including mould, are increasing in prevalence and severity and will continue to be a concern as warmer weather brings more allergen sensitivity. The prevalence of pollen allergy appears to be increasing, and there are associated economic costs (loss of work or school productivity) which can be addressed with new treatments and environmental control measures. Hay fever is a common and debilitating disease, affecting 3 million Australians. The prevalence of seasonal hay fever is higher in children and adolescents than in adults. There is a significant correlation between asthma and hay fever in school children. 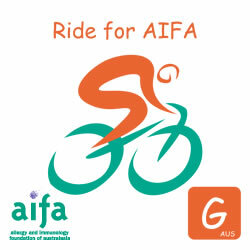 AIFA welcomed Michael Fries and his support crew into Circular Quay on 31st March after his epic ride from Melbourne. 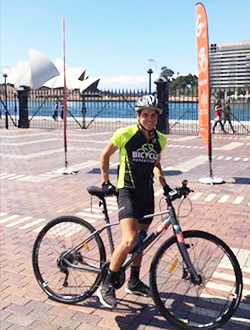 The team raised over $3200 for AIFA and spread the word through regional Victoria and NSW about our work. Michael raised the money on an innovative new app that encourages Generation Y to get into fundraising using small microdonations on their mobile phones. Donations will be accepted until the end of April. Every little bit helps to go a long way, as Michael knows. 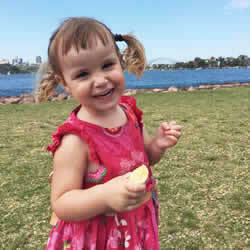 "To say that having a child with FPIES is stressful is an understatement," Dorotea's mother Amanda writes. "Getting help for these children is very difficult as the condition is rare and even many paediatricians are inexperienced in the management of it. Dorotea's first admission to hospital was after a severe reaction to soy formula. As is often the case, it was misdiagnosed as a viral gastroenteritis. The main symptom of FPIES is profuse vomiting, which can be accompanied by pallor, floppiness, hypotension and hypothermia. The FPIES reactions may be triggered by a variety of foods, although the most common triggers in Australia are staple foods such as cow’s milk, rice/oats, soy and eggs. Amanda explains that "the diagnosis of FPIES is just the beginning of what is often an incredibly exhausting few years. Because there is no testing available to ascertain what foods are safe, each new food needs to be trialled separately. We long to see this condition better understood so that families do not have to live with the exhaustion and uncertainty that marks our weeks." Tragically, last month a 57 year-old truck driver, Mark Williams, died after an allergic reaction to a bee sting in Western Australia. Allergies to venoms from stinging insects are one of the most common causes of severe allergic reactions in Australia. Following her revelation about her lupus diagnosis, singer Selena Gomez gave more details about her condition on the Ellen DeGeneres show recently. With millions of viewers worldwide, it was a great platform for raising awareness of this disease. Gomez explained that lupus is an autoimmune disease, which will stay with her for the rest of her life. Chronic illness changes people - it changes families. Chronic illness is not understood by those who aren't in the trenches with it. Chronic illness is a lifetime on the sidelines, battling for moments. A life not lived but endured. Lupus is most common in women (90%) and the majority develop the condition between 15 and 45.